September 11th 2001 was a tragic turning point in fate, with serious consequences for many nations afterwards. Angels exist to bring messages, protect humans, and to guide them. So upon such a fateful day, it is hardly surprising that many believe that angels came en masse to offer comfort and protection where they could. Thousands seemed to descend on the stricken sites to help, most notably at the site of the World Trade Center, which we look at here. The first obvious sign that angels were arriving came just after the first plane crashed into the World Trade Center. Several distinctive angels were seen breaking out of the smokes, such as the one on the left of this article. The distress and urgency on this Angel’s face is clear to see. It is almost as if the angels were waking up with a jolt, calling each other, and dashing to save as many people as they could. Which leads us onto what happened next. It is not unusual, when a community of mortals are in great danger, for angels to either enter mortals, or to give them angelic extra abilities. Most notable in the super-human rescue attempts was Rick Rescorla, the Morgan Stanley Security Chief. He single-handedly saved nearly 4,000 employees, but lost his own life doing so. He was supposed to be on holiday on 11th September 2001, but somehow fate brought him to the World Trade Center that day (angels?). 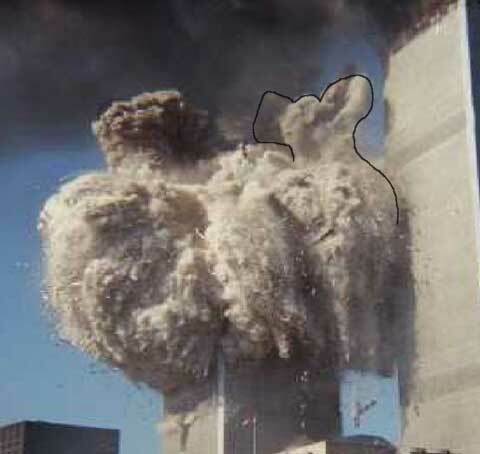 After the first tower was hit by a plane, he knew instantly that the second tower would be hit, according to those who were with him at the time. He began to evacuate the staff despite the dangers, and disobeyed a general order (over the World Trade Center speakers) for staff to stay in their offices. He kept the staff’s spirits up, and calmed their nerves by singing songs on the way out. In less than 15 minutes, before the second plane hit, he had somehow managed to evacuate nearly all of the Morgan Stanley employees. As a direct result of his actions, all but six of 3,700 employees survived. This was about quarter of all the people in the World Trade Center at the time. Rick was last seen going back to rescue other people from other companies, running up as high as the 72nd floor, despite being warned by another colleague that he had to get out. He was also in his early sixties, and suffering from cancer. Could angels have passed on the message to him about what was going to happen? He was a man in the best place to save more people than anyone else could at that moment in time. The total 9/11 death toll would have been more than double if Rick Rescorla had not known to evacuate the staff. Did angels bless him with the superhuman strength he possessed that day, taking him up to the 72nd floor? Did angels keep the employees protected until they were out of the building, despite the difficulties in evacuating so many people so quickly, without permission or immediate help? It seems a team of guardian angels may have been working together to help Rick Rescorla. Angels are the embodiment of pure love, and they are dedicated to serving the needs of mortals. They are completely selfless, whatever the cost to them, and will overcome obstacles to save mortals. Within literally minutes, the firemen from the New York City Fire Department were on the scene, despite the normal heavy New York traffic, and running into burning buildings. 411 emergency workers died at Ground Zero. However, during their efforts, they evacuated and rescued more than 5,000 other souls. The Coastguards helped evacuate up to a million people from lower Manhatten, to get them away from the toxic smoke. This included 2,000 injured people. There were no injuries or major hiccups during this mass evacuation. This was despite the huge numbers involved, the chaos, and the limited transport. It was as if the angels were working to sort out the logistical problems, perhaps again whispering in the ears of the people in charge, telling them what direction to take. Many reported just ‘knowing’ what to do, despite this being such a new situation. What do you think? Do you believe that angels took human form that terrible day to try to help? Yes, I belive it all. I have been involunterily directed by guardian Angels to save lives several times over the years. The lives I have saved have always been children who where just about to be involved in a serious accident. In each case those children would have almost certaily been killed. It all started after I had a near death experience which changed my whole way of thinking. I am no longer afraid of death and I now know that one of my reasons for living on earth is to save children. One day I will write a book in order to wake people up to the fact that we all have loving Angels with us from the day we are born. We may not be able to see them but they are has real as the invisible air we breath..!